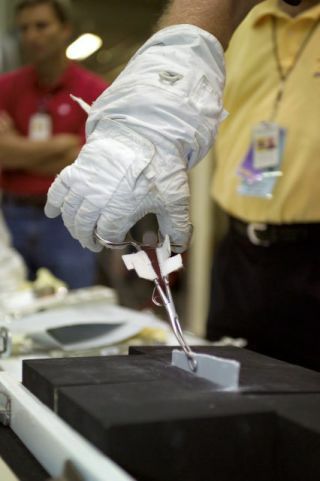 Engineers and astronauts test a gap-filler removal technique using forceps at NASA's Johnson Space Center. HOUSTON -The crew of the space shuttle Discovery will perform an unprecedented on-orbitrepair Wednesday, sending an astronaut under the orbiter's belly to remove a two strips of material jutting out from its tile-coveredheat shield, mission managers said Monday. Thedecision caps three days of scrutiny by imaging specialists, shuttle tileengineers, aerodynamicists and spacewalk planners to determine exactly how todeal with the two bits of ceramic fiber cloth - known as gap-fillers- sticking out from between heat-resistant tiles under the forward section ofthe Discovery orbiter. "In the endit came down to be a really simple decision," said Wayne Hale, NASA's deputy shuttleprogram manager, during a briefing here at NASA's Johnson Space Center (JSC). "We came to the conclusion that we don't know enough to really feel good aboutthis, so therefore the remedy is easy and we ought to go exercise the remedy." That remedyis an unprecedented spacewalkto send one astronaut, attached to a robotic arm, under the shuttle to pluckout the strips by hand, or cut them off if they prove too stubborn, Hale said.The extravehicular activity (EVA), currently expected to take about 90 minutes,will be folded into the timeline for the third and final spacewalk ofDiscovery's STS-114 mission, an early morning extravehicular activity set forAug. 3, he added. "I thinkit's a fairly simple task," Cindy Begley, lead EVA officer for Discovery'sflight, said of the repair plan earlier today. "It's just making sure we're notgoing to hit the vehicle, and we're doing that." Hale saidthat while the gap-filler repair is slated for an Aug. 3 spacewalk, an extraday added to the STS-114 mission on Sunday allows room to push the EVA backa day should the shuttle crew and spacewalk planners request it. "We wouldtake the extra transfer day that we've added...and move it in front of the EVAinstead of in back of it if they request," Hale said. The twogap-fillers jutting from Discovery's belly were not caused by impacts or foamdebris from the shuttle's external tank, and likely shook loose from thethin glue mount that connects them to the orbiter's undercarriage, shuttleofficials said. The ceramic material is used to keep the orbiter'sheat-resistant tiles from clattering against one another during launch, as wellas to fill in excess space between individual tiles, they added. If thefiller material sticks out from between tiles during reentry, they can disruptthe aerodynamic flow around the orbiter during reentry, causing higher thannormal local heating on the order of hundreds of degrees Fahrenheit, said ChuckCampbell, a NASA subsystem engineer who studies the heating issues associatedwith shuttle reentry. After athorough study, aerodynamic heating specialists were unable to say that the twoprotruding gap-fillers seen on Discovery would not pose a danger to its crew duringthe orbiter's planned Aug. 8 reentry through the Earth's atmosphere. "Given thatlarge degree of uncertainty, life could be normal during reentry or some badthings could happen," Hale said. "To set our minds at rest...the EVA team hasbeen off working hard for the last three days." During amorning status report, Begley said the EVA team plannedto use the robotic arm aboard the International Space Station (ISS) to maneuverSTS-114 astronaut Stephen Robinson underneath Discovery with his tools andtethers strapped close behind him to ensure he did not accidentally strike thevital heat-resistant tiles. Using his own, spacesuit-clad he fingers, he wouldthen pluck the gap-fillers one at a time, she added. Robinsonwill also carry a saw tool, scissors and forceps should the gap-fillers provetoo tough to yank out by hand, Begley has said. The gap-fillerremoval will likely take place after Robinson and his spacewalking partnerSoichi Noguchi, of the Japanese Aerospace Exploration Agency (JAXA), installthe External Stowage Platform 2 - a spare parts fixture for the ISS - to thestation's Quest module, shuttle officials said. Since therepair is a solo task, Noguchi will be free to retrieve a faulty rotary motorfrom the ISS and perform other tasks while Robinson removes and gap-filler. Thetwo astronauts have already tested out potential heat tile and reinforcedcarbon carbon panel repairs in their firstspacewalk on Saturday. They also retrieved the tools Robinson will use inthe gap-filler removal during an early morning spacewalktoday. Meanwhile,shuttle engineers are already looking at how to redesign gap-fillers and theirinstallation processes to prevent such protrusions in future orbiter flights,NASA officials said. Shuttleastronauts have repaired their own orbiters via spacewalks three times in thepast, once to replace a broken television camera and twice to properly stow aKu-band antenna, Hale said. "We'recommitted to safety," Hale said, adding that Discovery's flight is paving newground for NASA's shuttle program. "We're building up a new database and we'regoing to be smarter and safer in the future because we have this newknowledge."